Today has been another gorgeous day. 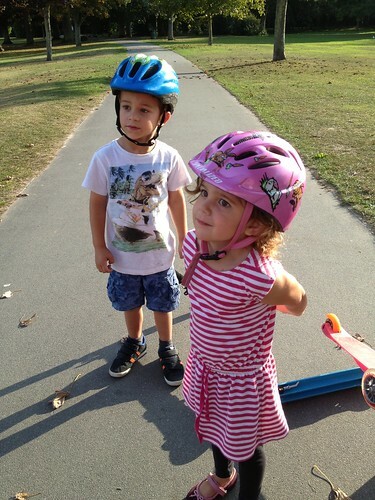 This afternoon we took a walk to our local park and met up with Auntie Josie for a wander, a coffee and a gossip. 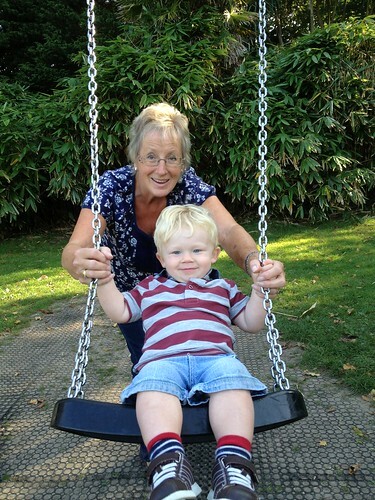 The kids had a lovely time on the swings! It was such a beautiful day today. We spent this afternoon at the beach with my sister and her family and some friends. It was glorious; warm and sunny and good company. The Little Mister spent ages looking for ‘nannies’. For some reason this is his word for snails and winkles. We have no idea why he calls them this though!! We have had a busy day of doing bits and bobs. It has been such a gorgeous day so some of it was spent in the garden. 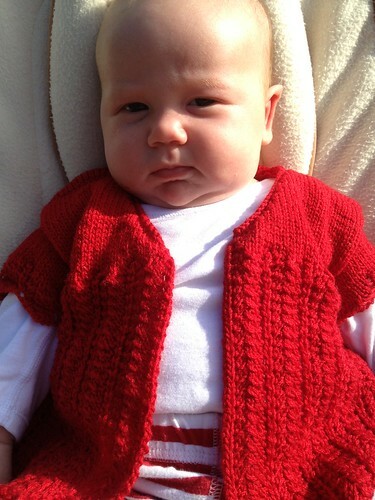 Today The Little Miss was wearing this gorgeous cardigan which was made by a friend of ours, actually it was for The Little Mister but he never wore it. I love it, it is so gorgeous and I wish she would make me one in my size! 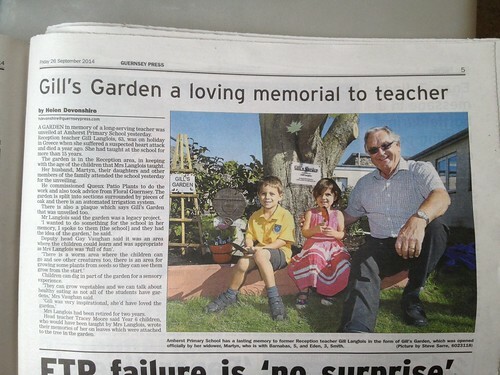 Today the local paper ran an article on the opening of Mum’s garden yesterday. 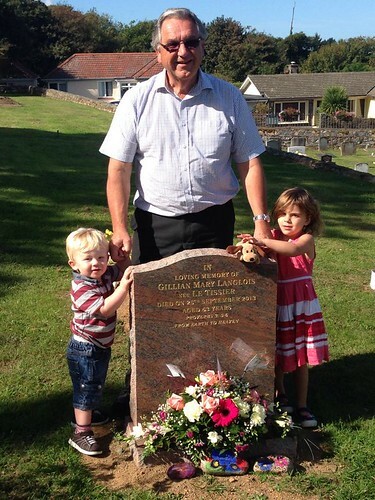 It was a lovely piece with a fab photo of Dad and two of his grandchildren. Nice to have some good publicity for the garden. Today marks the one year anniversary of Mum’s death. I cannot believe it has been a year already, Time has flown past and in that year so much has happened. Today my sister, the children and Dad all went to the grave to take Mum some flowers and children has painted some stones to leave on the grave. In the afternoon we had the pleasure of opening Gill’s Garden, a garden that Dad had built at the school Mum worked at. The children sang, dug for worms and planted some pansies. It was just lovely. In the evening we went out for a family dinner which was fab. Life without Mum is hard and a huge chunk of our family is missing BUT there is also good stuff. Dad has an amazing relationship with the grandchildren as well as with his daughters. We are very grateful for his presence and input into our lives. Mum would be incredibly proud of the fact that we have made it through the year intact, both as individuals but more importantly as a family. The one thing I have noticed over the year is that people deal with grief so differently. I have come to the conclusion that the best way to deal with it is assertively. We speak openly and frequently about Mum. We smile and laugh and reminisce about her and the stuff we did. We talk to the children about her and show them pictures. It feels healthy even if it is sad. 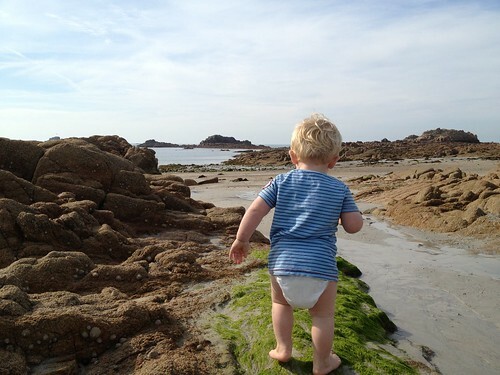 I have certainly noticed those people who are not prepared to assertively deal with their grief are not faring so well emotionally and I would like to encourage them to allow themselves to talk and think about Mum. It is incredibly restorative. 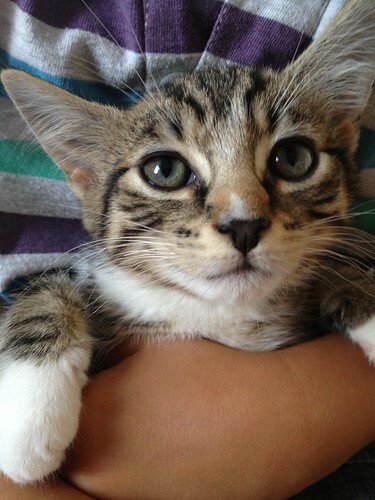 My beautiful boy is wonderful but he is also so naughty at times! He pushes my buttons more than anyone else and yet at the same time he also makes me laugh a lot. 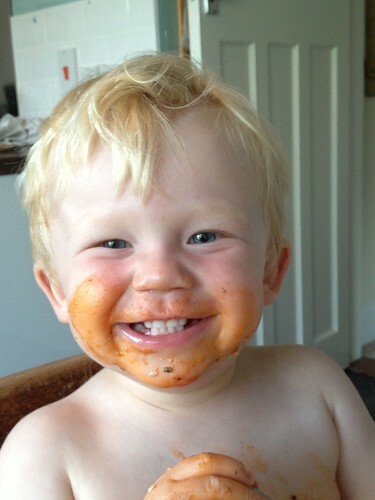 Today he thoroughly enjoyed his dinner of spaghetti bolognese with cheese on the top but the fact it looked like he had a ginger beard made me chuckle. Today I was very excited (tragically so in fact!) as my new baby Connecta sling arrived in the post. It is a gorgeous wrap conversion and is really comfy. 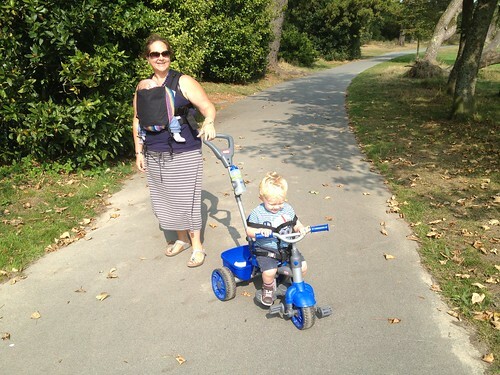 This afternoon I worse the sling and took The Little Mister out to the park for a quick trip out on his trike. It was a gorgeous day and lovely to spend some time with my sister and niece. 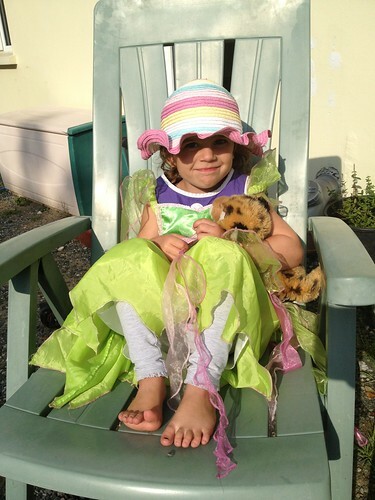 My niece is awesome and very stylish! I think she might be a fashion designer when she grows up. My sister has got two new additions to the family. Two gorgeous kittens called Oliver and Petcy. They are amazing natured little puss-cats and are putting up with a lot of man handling! This is Percy being loved by Barnabas!